• The Youngstown State men's basketball team plays its second of three consecutive road games when it visits Wright State, Wednesday, Feb. 5. • Tipoff is set for 7 p.m. at the Nutter Center in Dayton, Ohio. • This is the second meeting between the two schools in 11 days. • The game can be heard on 570 WKBN-AM and iHeartRadio and fans can also watch the game live on ESPN3.com. • The Penguins dropped a heart-breaking 86-85 decision to Oakland on Jan. 31, in Rochester, Mich. The Penguins led by 11 in the second half, and led by one after two free throws by Kendrick Perry with 8.8 seconds remaining. • Oakland's Khalil Felder made two free-throws with four seconds left to lift OU to the win. • Sophomore Ryan Weber scored a career-high 20 points and tied a career best with nine rebounds. Senior Kamren Belin scored 18 points and made four 3-pointers and Perry added 17 points. Sophomore Bobby Hain posted a double-double with 14 points and 10 rebounds while junior DJ Cole scored 10 points with nine assists. 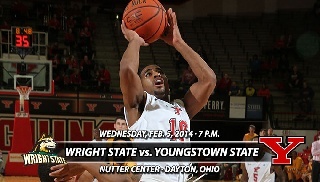 • This is the 49th meeting between Youngstown State and Wright State in a series that dates back to 1977. • The Raiders own s 38-10 advantage in the all-time series and have won the last 13 games played at the Nutter Center. • The last time Youngstown State won at Wright State was a 62-56 win on Dec. 17, 1994. • The Penguins won the last outing, 68-67, at the Beeghly Center on Jan. 25. • Wright State enters the game with a 13-12 overall record and a 5-5 mark in the Horizon League. • The Raiders have lost their last three games, but are the Horizon League's top defensive team, allowing a league-low 61.6 points per game. • Senior AJ Pacher leads the team with 10.2 points per game and is shooting 60.5 percent from the field. • With 97 assists, Kendrick Perry is three shy of posting his fourth straight season with at least 100 assists. • Perry would become the first player in YSU's Division I history to record that accomplishment and just the second player in school history to do so. • The other was Terry Moore, YSU's all-time assist leader with 619, who had four straight seasons of 100 assists or more between 1973-76. • Sophomore Ryan Weber posted a career-high 20 points in YSU's 86-85 loss at Oakland on Jan. 31. • Weber also tied career highs with nine rebounds and four 3-pointers made. • It marked the fourth time this season Weber made four 3-pointers in a game. • The other times were against Kennesaw State (11/8/13), Eastern Kentucky (11/10/13), and Milwaukee (1/2/14). • Sophomore Bobby Hain has been making a name for himself over the course of his second season. • During the last 11 games, Hain has averaged 12.6 points and 6.2 rebounds per game. • He has also made 54 of his last 90 field-goal attempts for a .600 field-goal percentage. • Overall, Hain ranks eighth in the Horizon League with a .543 field-goal percentage. • Hain, who has four double-doubles this season, has two double-doubles in the last 11 games and has posted at least six rebounds seven times during that span. • Hain posted his most recent double-double with 14 points and 10 rebounds in an 86-85 loss at Oakland on Jan. 31. • Sophomore Ryan Weber has been a definitive 3-point threat for the Penguins. • Weber leads the Penguins with 50 3-pointers and ranks tied for third in the Horizon League with 2.2 3-pointers made per game and fifth with a .417 3-point percentage. • Over the last 11 games, Weber has made 30-of-62 from behind the arc for a .484 3-point percentage. • Weber is also shooting 48 percent (49-of-102) from the field and 86.4 percent (19-of-22) from the free-throw line.